Once you've created Virtual Goods on the Portal, you can incorporate them in your game. To help test the Virtual Goods, create an Event on the portal which takes an attribute of type NUMBER. Using Cloud Code, accredit the player an amount of currency passed in through the NUMBER attribute. 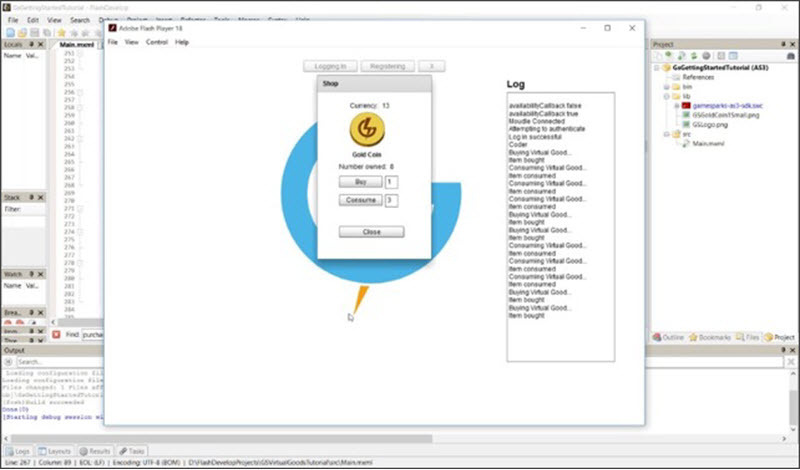 Create a function to log the BuyVirtualGoodsRequest and a function for the ConsumeVirtualGoodRequest. Create a function to handle the BuyVirtualGoodsRequest. Create a function to handle the ConsumeVirtualGoodRequest, which logs an Event to accredit the authenticated player with extra currency. Create a function that updates the player's currency and amount of Virtual Goods owned by using the AccountDetailsRequest. Launch your game and buy and consume Virtual Goods to see your details being updated accordingly. 1. Navigate to Configurator > Events and click Add. The Add Event page opens. 2. Create an Event that credits the authenticated player with extra currency. 3. Add an Attribute that will be used to indicate the amount to credit. 4. Save the Grant currency Event and navigate to Configurator > Cloud Code and under Scripts click Events. 6. Next, get the player object using Spark.getPlayer() and credit their CURRENCY_1 with the money value. //Credit the player with the amount asked for the chosen currency and the reason. 7. 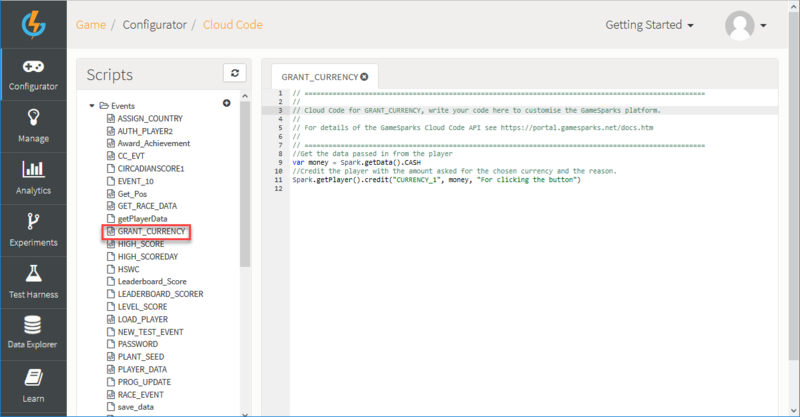 Click to Save the Cloud Code you've added to the GRANT_CURRENCY Event. 8. Create a function which will log a buyRequest when called by using BuyVirtualGoodsRequest. The BuyVirtualGoodsRequest needs your custom currency Short Code, a quantity, and the Short Code for the item to be purchased. 9. Create a function for the consumption of Virtual Goods, this will use the ConsumeVirtualGoodRequest. The ConsumeVirtualGoodRequest needs a quantity and Short Code of the item to be consumed. Have the functions check the response for errors. If the response has no errors, then send a string to the logger. For the consume response, if there are no errors, call the Event which accredits the player with extra currency. When either response handler reaches the end of their sequence, the shop data will be updated. For the currency it's a simple text display. For the Virtual Goods, retrieve the Virtual Goods through getVirtualGoods() method, followed by the Short Code of your Virtual Good which retrieves a Number of the Virtual Goods of that type. When you click buy, the currency depletes in exchange for an increased amount of Virtual Goods. When you consume items, the currency should go up but the amount of Virtual Goods owned should decrease.